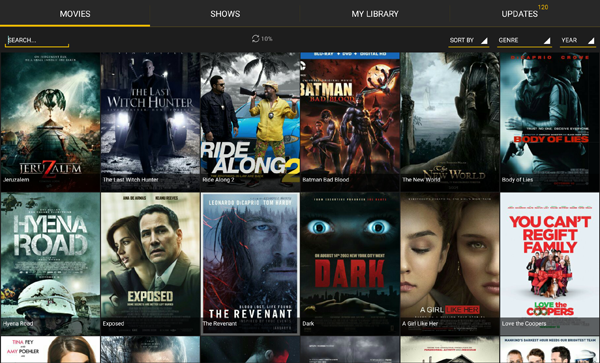 Showbox is a hugely popular all-in-one application for viewing the latest movies and TV shows on Android platforms and, with a tweak or two, on desktop machines too. Quite possibly installed on millions of devices, Showbox has just added free Spotify-like music streaming functionality, a move that's bound to irritate the labels. In a ‘pirate’ world consumed by web-streaming, BitTorrent and software such as Popcorn Time, there’s no doubt that desktop users are spoiled for choice. However, for users of the Android system there is a seriously powerful beast that’s been gaining traction for some time now, one that not only downloads from both BitTorrent networks and direct sources but also presents the results in a tidy Netflix-style interface. While Showbox hasn’t been endlessly reported in the media in the way that Popcorn Time has, the software is already in use on hundreds of thousands – probably millions – of tablet and cellphone devices. And, since it also runs on Windows emulators such as Bluestacks, it’s likely that thousands of desktop installations exist too. But more recently Showbox has become a much-installed package on countless set-top devices, including but not limited to Amazon’s Fire Stick, bringing all the latest movies and TV shows into the home with a minimum of fuss. Since Showbox can stream from non-P2P sources too (it defaults to that, in fact), it offers a decent level of anonymity too. 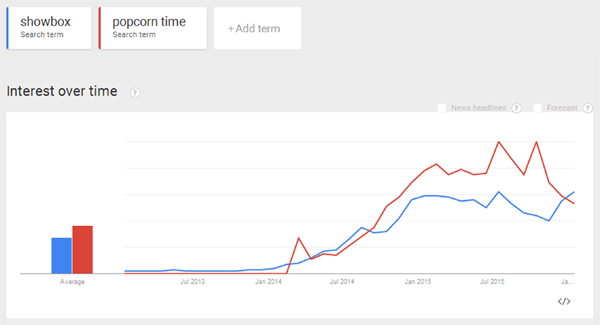 All that has led to a boost in popularity on a similar curve to that enjoyed by Popcorn Time. With all the latest movies and TV shows at hand to either stream or download (with a choice of qualities and subtitles thrown in for good measure) Showbox is definitely on the radars of the Hollywood studios. But for reasons that aren’t entirely clear, little appears to have been done about the software. Certainly, there has been no Popcorn Time legal response to speak of. Whether that has played a part in the software’s latest development is unclear but during the past few days Showbox added a controversial new feature that’s likely to infuriate not only Hollywood but also the world’s major record labels. The latest version (v4.51) now has the ability to stream and download music. Present for now only when run on a cellphone device, Showbox’s music menu is illustrated on the left of the image below. A small sample of its popular music section appears on the right. Without a detailed network analysis (we’ll leave that to others) it’s unclear where Showbox is pulling content from. However, it’s certainly possible that Russian social network vKontakte is playing a part as it has previously with movies and TV shows. Either way, the catalog of content appears to be pretty deep, featuring both fresh content and plenty of classics from the archives. Its built-in media player is an obvious inclusion and users will be pleased by the addition of a playlist creator and a means to share content with friends. While Showbox is certainly not available from Google Play or Amazon (it must be sideloaded by the user) the eagle-eyed will have noticed the advert for Amazon in one of the images above. In fact, advertising for mainstream products and services appears regularly when viewing Showbox, often as pre-run videos when running the tablet version, for example. In fact this morning when carrying out tests it appears that the South African government was dropping a few coins in the collection box, with adverts for tourists to come and enjoy a holiday in the country. 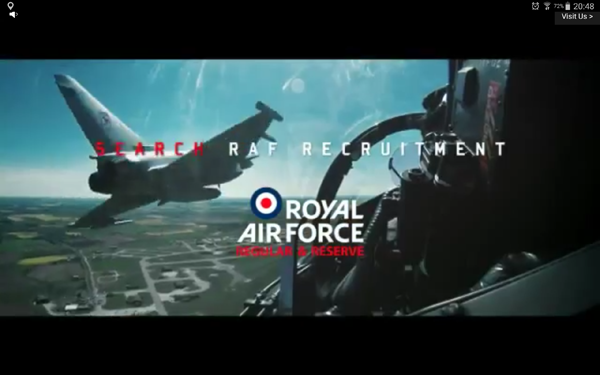 Shortly after the British government was contributing too, with a 30 second video slot recruiting for the armed services. 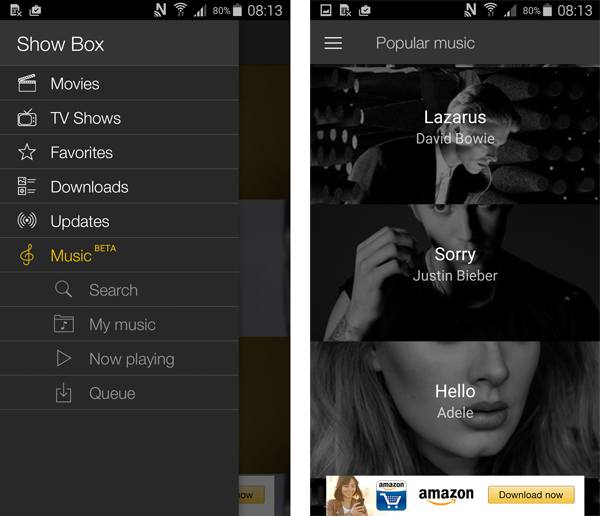 Showbox is certainly a powerhouse when it comes to streaming video content and now that it’s entered the music field too, there are few (if any) applications that can compete with it. 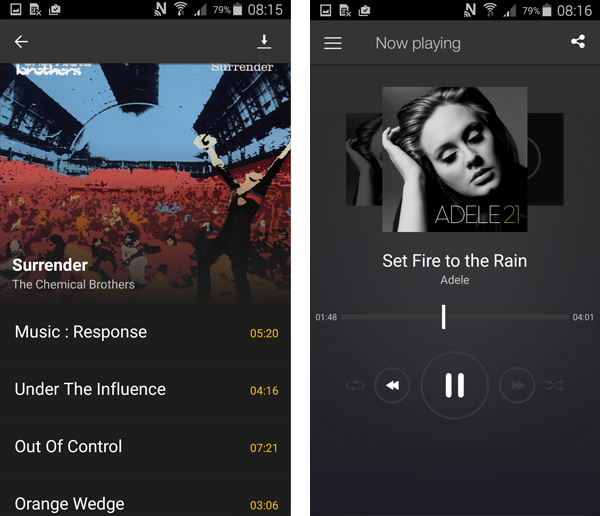 The music section is lacking the finesse of Spotify though, but the developers reiterate the service is only in beta so there could be more to come.